One of the chief problems in market gardening in the open and under glass is the supply of humus. The introduction of the internal combustion engine changed this: a general shortage of manure resulted. In most cases market gardens are not run in connection with large mixed farms, so there is no possibility of making these areas self-supporting as regards manure: the essential animals do not exist. The result is that an increasing proportion of the vegetables sold in the cities is raised on artificial manure. In this way a satisfactory yield is possible, but in taste, quality, and keeping properties the product is markedly inferior to the vegetables raised on farm-yard manure. 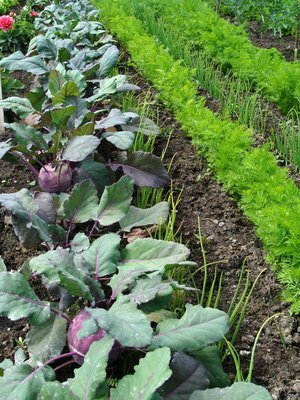 It is an easy matter to distinguish vegetables raised on NPK. They are tough, leathery, and fibrous: they also lack taste. In marked contrast those grown with humus are tender, brittle, and possess abundant flavour. In the first place, market gardening should, whenever possible, be conducted as a branch of mixed farming with an adequate head of live stock, so that all the waste products, vegetable and animal, of the entire holding can be converted into humus.